GoTo, the island’s first national car sharing service, has surpassed expectations and in just four months close to 4,500 drivers have registered to use its fleet of electric cars. According to the company’s latest figures, more than 65 per cent are using this service more than five times a month and 15 per cent are making 20 trips a month. Although the service has proved to be a tempting alternative for drivers of all ages, those aged 25 to 31 are the ones who this service the most (33 per cent). The heaviest usage of GoTo cars has been experienced mostly in Valletta, Sliema, Ta’ Xbiex, Msida, the airport and Cirkewwa, while the average length of time spent driving a GoTo car is 23 minutes. Drivers have quickly caught on to the advantage of having a guaranteed parking space in Sliema or St Julian’s, and some are splitting the cost of the trip for a cheaper, more eco-friendly journey, according to users’ comments. 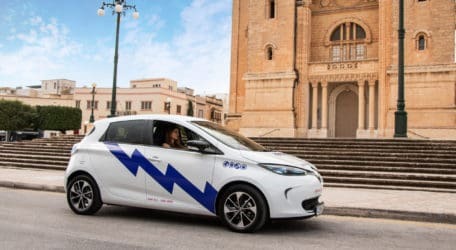 The initiative, which is intended to tap into the global green trend to shift from ownership to usership to get around congested cities, will help reduce traffic in the Maltese Islands in the longer term. By May the company is also planning to roll out the second phase of its project which will be created for longer return journeys. The user will be able to book cars up to three months in advance, as well as pick up and return the car to the same spot. “The plan is to launch this service in 30 new locations following a collaboration with private car parks. We are buoyed by the public’s response and hope that the use of electric cars and car sharing continues to pick up — we want to be part of a national transportation system where we give users a real alternative to ditching their cars for a greener future,” Mr Golan said.